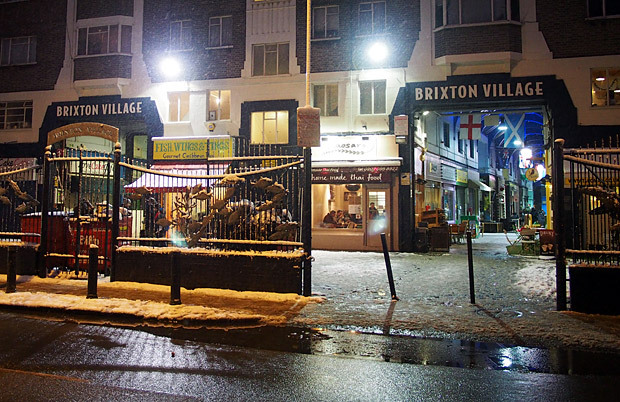 With the snow falling deep and thick and even over Brixton on Sunday, I ventured out again to grab a few photos from around town. 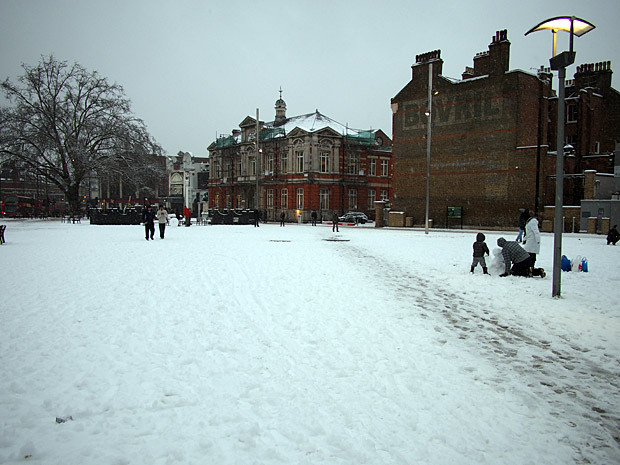 Perhaps my favourite scene was the one above in Windrush Square, where an impressively large snowman had been created. 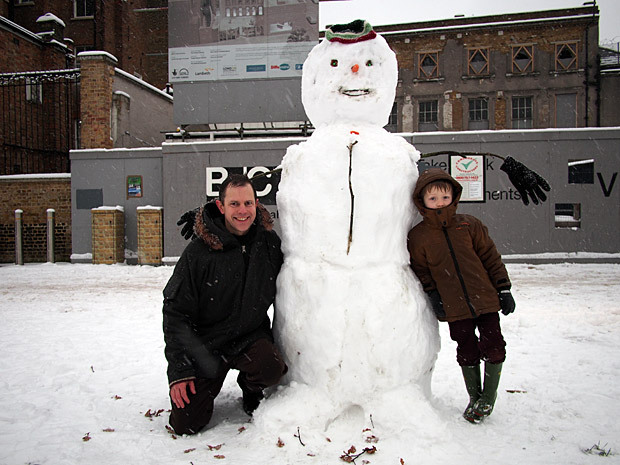 I suspect the Dad got more out of the building experience than his son! 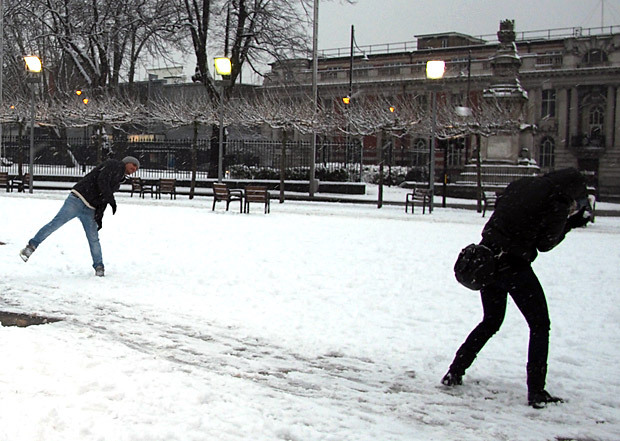 Snowball fight in Windrush Square. 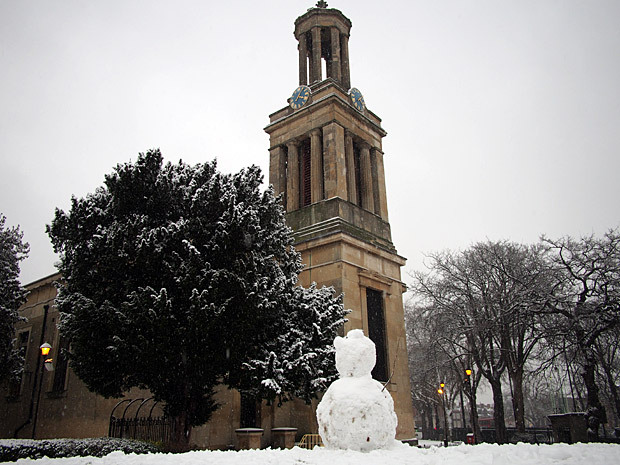 A rather more modest snowman in the grounds of St Matthew’s Church. 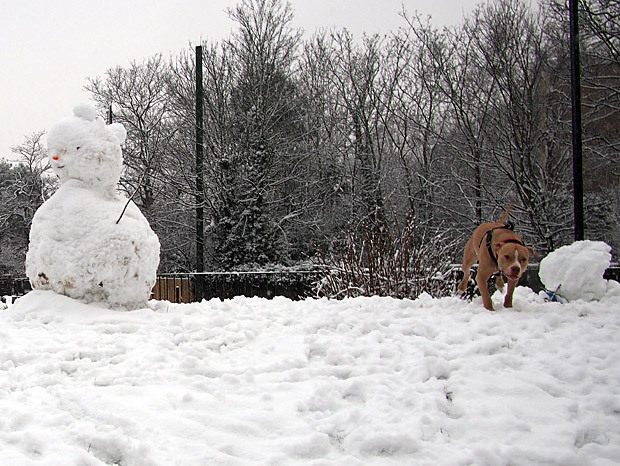 There was originally two snowmen standing next to each other, but this burly dog had just mercilessly demolished one. 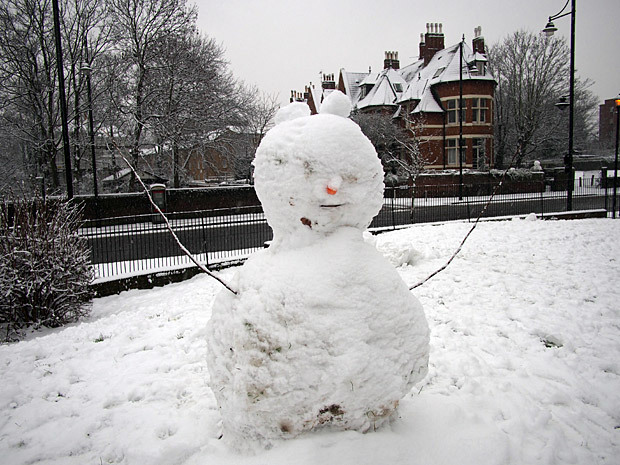 It almost looks like the remaining snowman is trying to flee the scene in fear! 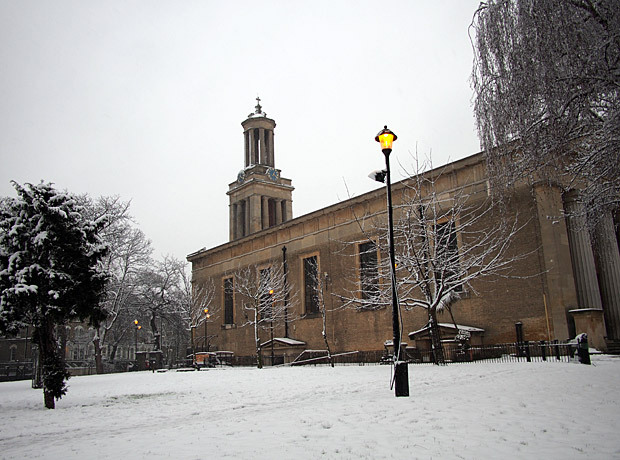 One of four new Lambeth parish churches built in response to the growing population in the early 19th century, St Matthew’s church was consecrated in 1824, and features an imposing facade created by the architect C.F.Porden. 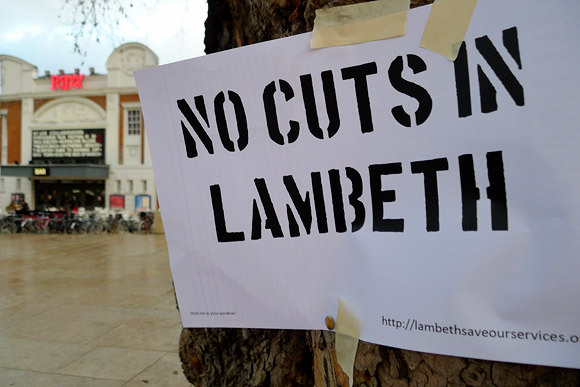 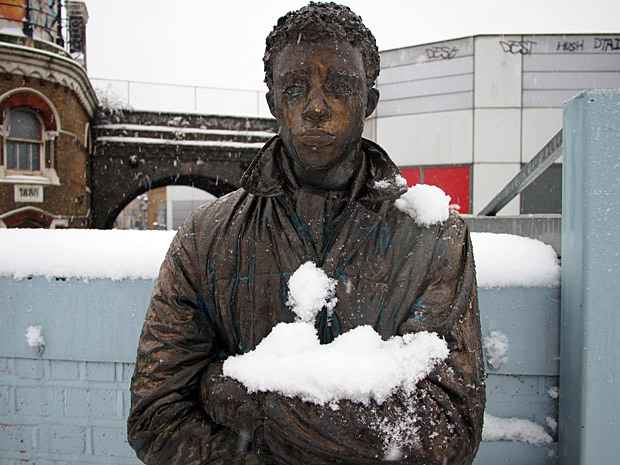 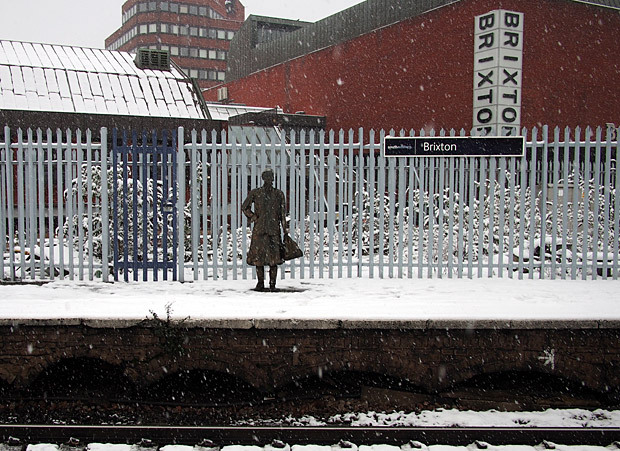 One of Brixton station’s famous statues permanently waits for a train. 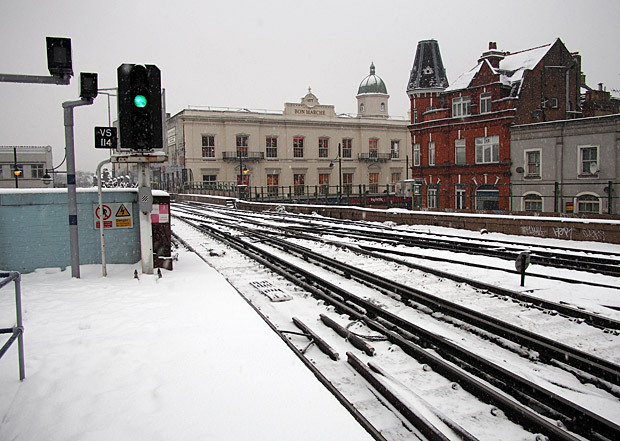 Looking across the snowy tracks into Brixton station to the old Bon Marche building, which now houses the busy TK Maxx department store. 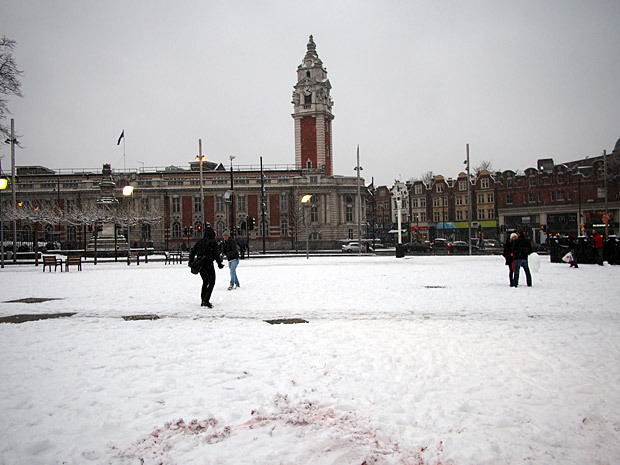 Bon Marché’s opened in Brixton in 1877 in the first purpose-built department store in the country. 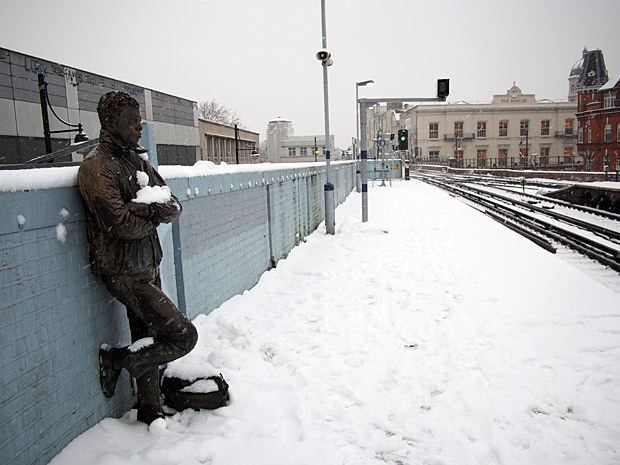 Read some of its history here. 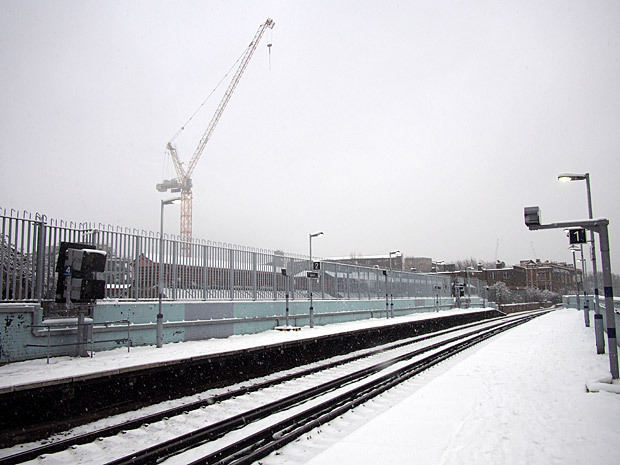 The crane in the distance is towering over the ghastly Brixton Square development on Coldharbour Lane. 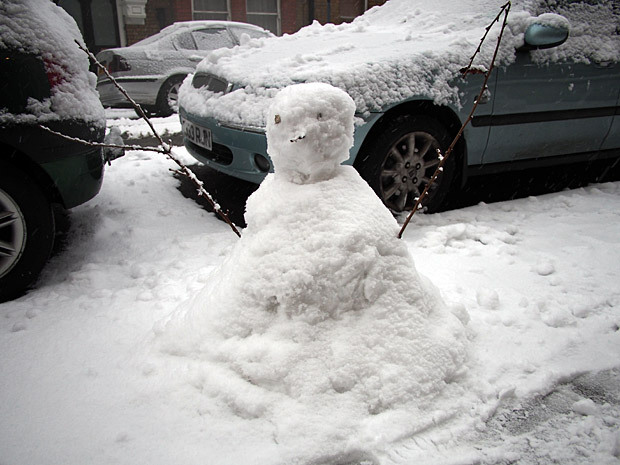 A bijou snowman on Rushcroft Road. 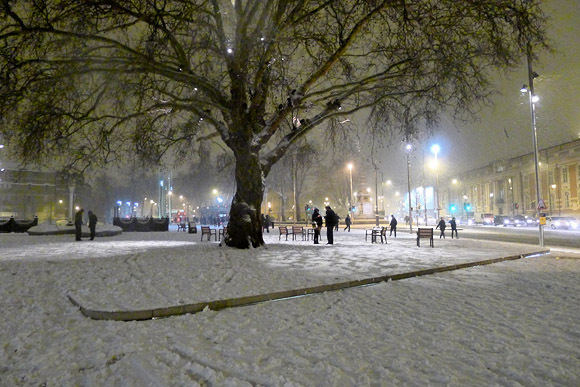 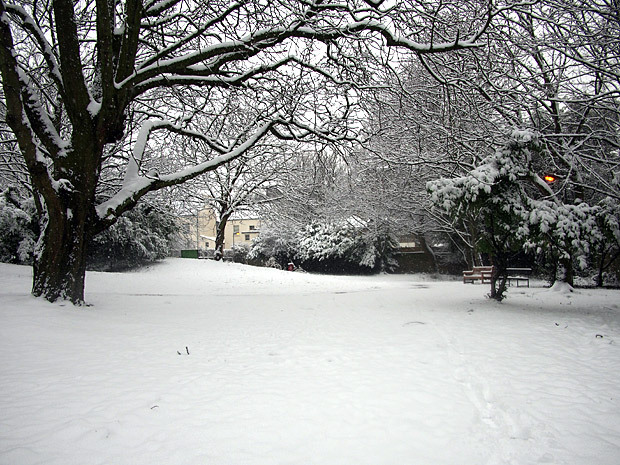 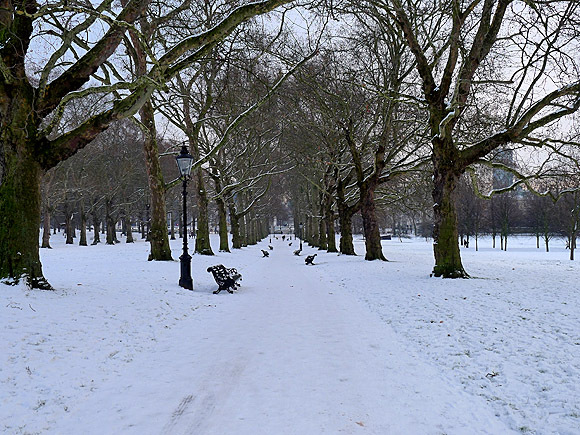 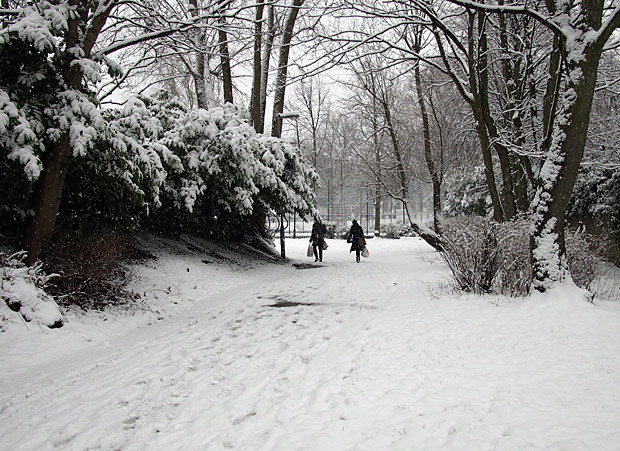 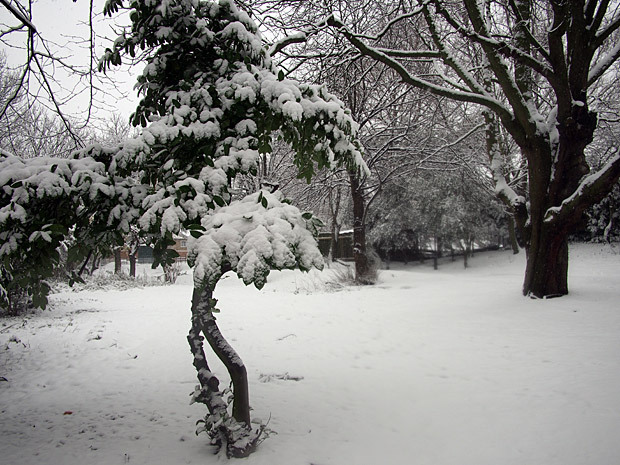 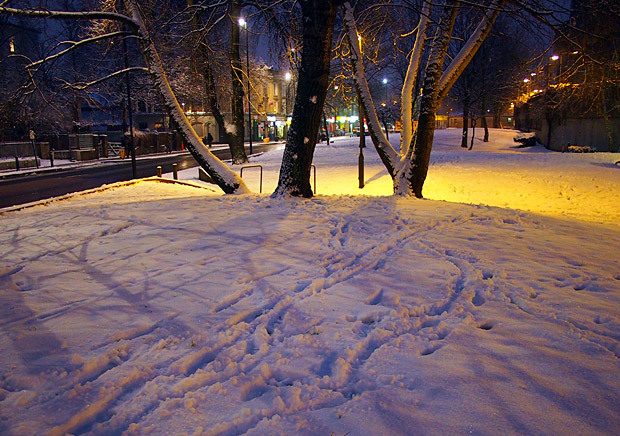 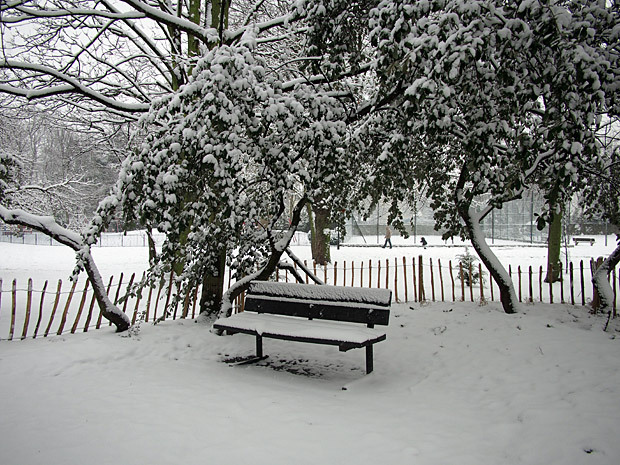 One of Brixton’s lesser known public spaces, Loughborough Park looked lovely in the snow. 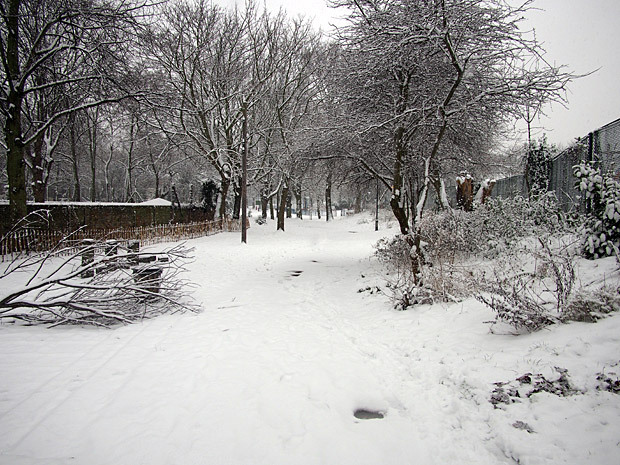 Big improvements are coming to the park in 2013. 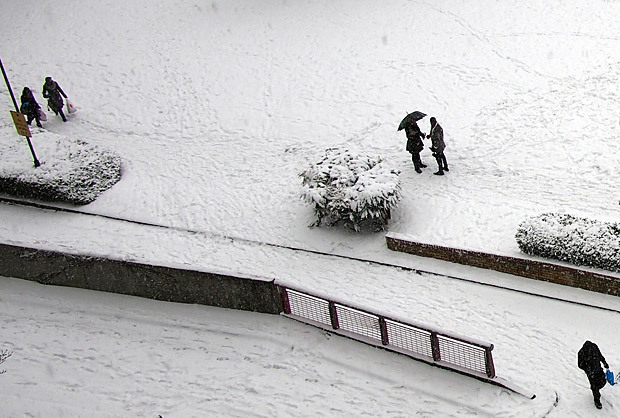 Having a chat outside the Barrier Block. 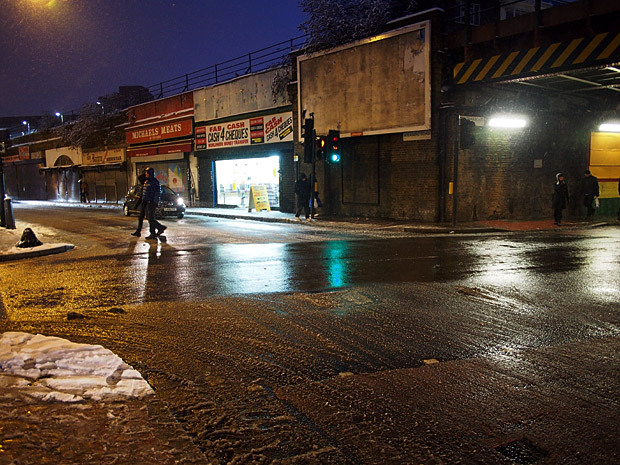 Wet and cold scene at Coldharbour Lane/Atlantic Road. 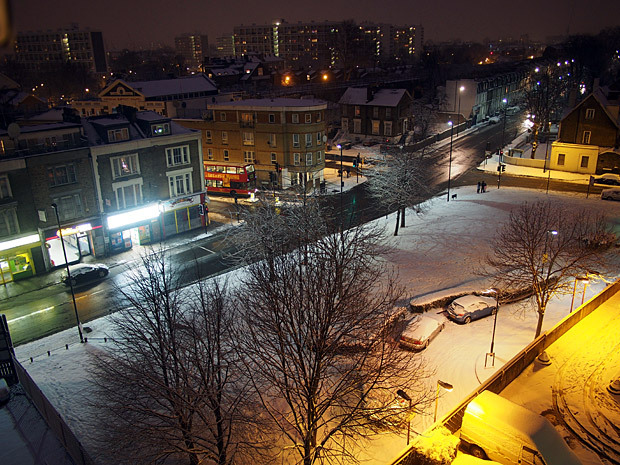 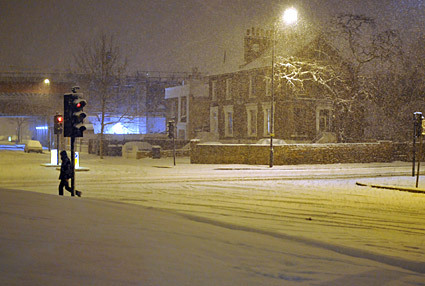 A last late night look across Coldharbour Lane. 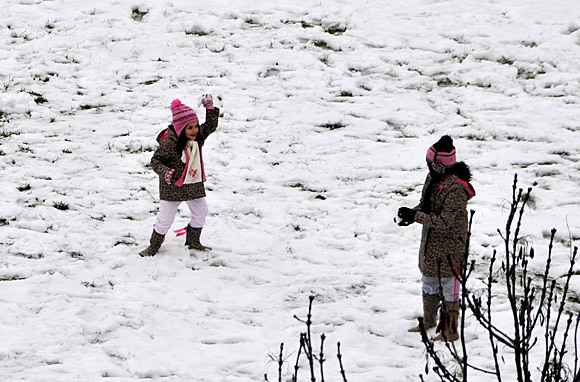 A large snowball fight broke out later on!